Iron your finest dirndl and unpack your best lederhosen, because Oktoberfest is back for its 184th year! More than six million people will gather in Munich, Germany to celebrate all things Baravian from traditional music to mouthwatering local fare. The 16-day festival features live music, frothy pints of beer, amusement rides, smoked sausages, sauerkraut, and did we say beer? The first Oktoberfest was held to celebrate the marriage of Bavarian Crown Prince Ludwig and Therese of Saxe-Hildburghausen, in 1810. 200+ years later, the party has grown to incorporate games, music, and copious amounts of beer. Oktoberfest officially starts when the mayor of Munich taps the first barrel keg by hand and shouts “O’ zapft is!” or “It’s tapped!” in English. 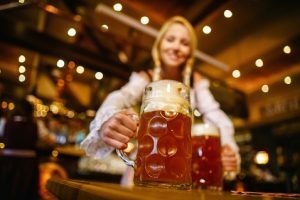 Any beer served at Oktoberfest must hail from one of Munich six breweries, Paulaner, Spaten, Hacker-Pschorr, Augustiner, Hofbräu, and Löwenbräu. Per festival regulations, Oktoberfest beers must pass the Reinheitsgebot law, which was originally passed in 1516. This law ensures that the quality of the beer is up to Bavarian standards. When drinking large mugs of frothy beer, it’s important to nourish yourself with hearty Bavarian foods. Traditional fare includes soft pretzels, Weisswurst (white sausage), Bratwurst, Currywurst, slow-roasted ox, Schweinshaxe (large portions of pickled ham), and gingerbread hearts! If you’re lucky enough to attend this year’s festival, don’t leave without proof! Bier Steins are popular souvenirs with festival-goers. The porcelain mug is hinged with a pewter lid, and serves as the perfect reminder of your Bavarian experience! AESU offers several trips to Germany, including Cosmopolitan, Euro Spree, Explorer, Euro Focus, and our most popular tour, Great Escape. Explore Germany, and celebrate Oktoberfest with the locals! This entry was posted on Wednesday, September 6th, 2017	at 3:09 pm	. You can follow any responses to this entry through the RSS 2.0	feed. Responses are currently closed, but you can trackback from your own site.